Small towns along the state’s international border surround artful and tasty delights with sublime vistas—and a hint of revolutionary spirit. Above: Pancho Villa State Park. Photography Courtesy New Mexico Tourism Department. HEAVENLY SOUL FOOD AND HOMEMADE PIES, the site of a 20th-century foreign invasion, a winery specializing in Italian varietals, one of the Southwest’s most impressive exhibits of indigenous pottery, baskets, and textiles. Encounter these treats—and more—during a drive through New Mexico’s southern borderlands, through a sun-drenched Chihuahuan Desert dotted by craggy mountain ranges and a handful of friendly towns, including Deming and Columbus. Get set for unexpected—and occasionally offbeat—pleasures. Deming has plenty of well-kept chain properties, including the Best Western Deming Southwest Inn, an affordable retro-style motel with cheery rooms, a seasonal outdoor pool, and a handy location within walking distance of downtown. In Columbus, your only lodging option is Los Milagros Hotel, but this simple, unfussy two-story inn is a terrific little bargain. The six rooms have balconies, comfy beds, and Spanish Colonial accents. As you wrap up your adventure, Las Cruces makes a great lodging base, home to the elegantly furnished seven-story Hotel Encanto, whose amenities include a large pool with cushy cabanas and the popular Garduño’s Cocina & Cantina. In Old Mesilla, the richly historic Casa de Rosie B&B is anchored by a gurgling fountain and contains three charming rooms decorated with original artwork and handcrafted furnishings. It’s just steps from the Plaza. THE ROUTE: After spending your first day and night in Deming, depart town by heading E. on NM 549 for about 12 miles to Adobe Deli. Then backtrack W. on NM 549 for 4.5 miles and turn S. on NM 143 about 4 miles to Rockhound State Park. Next, drive 6 miles W. on NM 141, then 27 miles S. on NM 11 to Columbus. From here, it’s a 70-mile drive E. on NM 9 to reach Sunland Park, and another 40 miles N. on either I-10 (faster) or NM 28 (a bit more scenic) to reach historic Old Mesilla, near Las Cruces. New Mexico is blessed with outstanding history museums, but few contain a more exhaustive and intriguing assortment of memorabilia and artifacts than the Deming Luna Mimbres Museum, renowned for its world-class collection of Mimbres pottery, baskets, and textiles from the 11th and 12th centuries. Admission is free. But as you amble through this formidable, century-old former National Guard Armory building, be sure to explore every room. You’ll discover vivid Western paintings, whimsical liquor decanters, women’s fashions from the early 1900s, dazzling local gemstones, and antique autos. The museum also operates and gives tours of the distinctive Territorial-style, adobe-walled building across the street, the Historic Seaman Field Home, which once served as the town’s customs house. Walk north and west to the corner of Gold Avenue and Spruce Street—the statue of two massive and colorful Mimbres pottery vessels clues you in that you’re in the right place. A half block east, at Elisa’s House of Pies-N-More, engaging owners Elisa and Curtis Jackson serve delicious soul food in a cozy redbrick lunchroom with tree-shaded seating out back. Think barbecue beef ribs, cornmeal-dusted tilapia, fried chicken, and a gluttony of sides, including mac and cheese, collard greens, and candied yams. Of course, no trip to Elisa’s is complete without sampling one of her decadent homemade pies, available in dozens of flavors, from caramel-pecan to strawberry–cream cheese mousse. The Mimbres Valley’s dry climate and mineral-rich soils produce outstanding wine. Deming is home to a pair of esteemed vino operations: St. Clair Winery, on the east side of town, and Luna Rossa, which occupies a rangy single-level adobe building on the west side. In its handsome tasting room or on the sunny patio, you can sample the complex, dry Italian-style varietals produced by Paolo and Sylvia D’Andrea, including stellar Dolcetto, Montepulciano, and Sangiovese. You’ll find Adobe Deli, one of New Mexico’s greatest little culinary and cultural oddities, down a remote desert road nearly 15 miles east of downtown Deming. The bronze bull and a somewhat decrepit vintage trolley car outside this rambling former school are hints that this establishment isn’t so much a deli as it is a trove of art and found objects. Step inside and you’ll discover a bounty of antique tools, taxidermied wild animals (from elk to alligators), police uniform patches, ancient New Mexico highway signs, and eclectic paintings. Grab a seat in the dark saloon-style dining room and peruse the menu, which appeals especially to carnivores with juicy porterhouse and rib eye steaks, plus such old-school faves as osso buco and Alaskan king crab with drawn butter. At lunch, you can’t go wrong with the French onion soup or deli sandwiches, best enjoyed with a side of gargantuan onion rings. An extensive craft beer selection tops it all off. 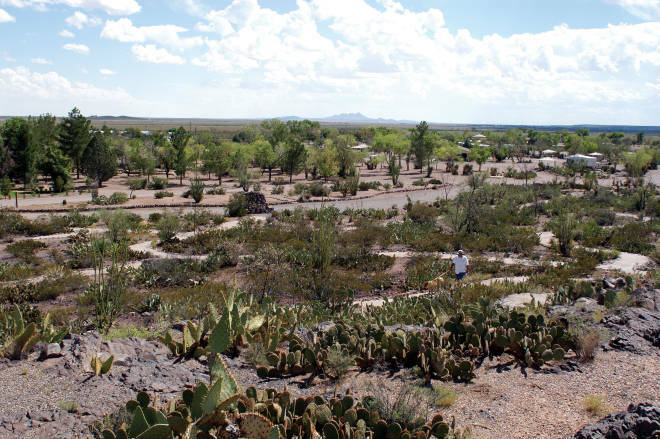 As you make your way south toward Columbus, detour briefly to Rockhound State Park, set in the foothills of the soaring Florida and Little Florida Mountains, which rise dramatically above the Chihuahuan Desert floor. As the park’s name suggests, this is something of a rock-collecting paradise—visitors can legally carry away up to 15 pounds of rocks, including rare sparkling geodes and thunder eggs, which have made this region famous among rock and mineral aficionados. You can also embark on short hikes offering dramatic views in the park’s Spring Canyon section. The precipitous 0.8-mile jaunt to Lover’s Leap Canyon rewards hikers with especially dazzling vistas. In the small border community of Columbus, learn about one of the very few foreign invasions of the United States, the 1916 cross-border raid by charismatic Mexican general Pancho Villa. The mustachioed marauder led about 600 troops on his attack but was turned back by U.S. troops and local civilians at Camp Columbus (later Camp Furlong). All told, 18 Americans and 80 Mexican “Villistas” lost their lives in the altercation, which is detailed at Pancho Villa State Park, home to a former U.S. customs house, numerous historic outbuildings, and an exceptional modern visitor’s center with memorabilia and exhibits about the invasion. You can also follow a short path to Cootes Hill, a small bluff that served as the camp’s lookout and was briefly overtaken by Villa’s troops. Across the street, the Columbus Historical Society occupies the town’s handsome 1902 former rail depot and has filled it with antiques, photos, and other documents related to the town’s unusual history, including a replica of Pancho Villa’s death mask. Provided you bring your passport, you can enjoy dinner at the region’s most memorable restaurant, the Pink Store. Getting here requires a short stroll across the Mexico border from Columbus into the peaceful village of Palomas. The restaurant adjoins a huge show-room of colorful folk furniture, ornately carved mirrors, colorful figurines, stylish hats, and other attractively priced goods. The convivial dining room is ideal for enjoying potent margaritas and classic Mexican fare—consider the Pancho Villa Plate, with a cheese enchilada, beef taco, and chile relleno. You won’t encounter any towns or even roadside attractions during the 60-mile drive on NM 9 from Columbus to Sunland Park, but this peaceful stretch of gently sloping blacktop offers expansive views both across the border into Mexico and north and east across New Mexico. It’s the perfect drive for blasting your favorite tunes and soaking up sunshine on a crisp winter day. As you approach Sunland Park, the Franklin Mountains come into view, rising above El Paso, and to the northeast you’ll spy the jagged peaks of the Organ Mountains. The small bedroom communities of Sunland Park and Santa Teresa hug both the Texas and Mexico borders and function primarily as bedroom communities for Las Cruces and El Paso. Test your luck at Sunland Park Racetrack & Casino or enjoy a memorable meal of elaborately prepared Italian food at Ardovino’s Desert Crossing, an atmospheric restaurant on a hillside overlooking the region’s lofty mountains. It’s close to Mount Cristo Rey, a rocky hill crowned by a 29-foot limestone statue of Christ. In Santa Teresa, Billy Crews Dining Room is legendary for its 123-page wine list and thick, tender steaks. Conclude your adventure in Old Mesilla, a small, historic town that sits on the south side of Las Cruces and was incorporated in 1848, when this area became part of the United States, following the Treaty of Guadalupe Hidalgo. Territorial-style and Spanish Colonial adobe buildings filled with boutiques, galleries, and eateries surround the colorful plaza, anchored by twin-spired Basilica of San Albino. In Mesilla you’ll also find a second location of Luna Rossa Winery, complete with a terrific pizzeria serving thin-crust pies and rich homemade gelato. Southwestern New Mexico offers year-round shorts-and-tees weather, even in midwinter, when daytime highs often exceed 60 degrees—ideal temps for scampering around Rockhound State Park or strolling a few hundred feet across the border into tiny Palomas, Mexico. Deming’s handful of quirky shops and two wineries also deliver great holiday gift shopping, as do the many galleries and boutiques in Old Mesilla, the site of an annual Christmas Tree Lighting in early December and caroling and luminarias on Christmas Eve (see “Do You Hear What I Hear?”).